COLORADO RIVER ROAD — For the past year, it’s not been a simple proposition to navigate along one of the northern-most roadways of Eagle County. That changed Monday when the Red Dirt Bridge officially opened after a ribbon-cutting ceremony. “I know a guy who runs float trips along the river and he is super exited about it,” said Walter Hensrud, a resident of the Colorado River Road. Hensrud and his wife, Jan, live west of the bridge construction, so they were not as directly affected by the traffic closures and construction mobilization at the bridge construction site. But the effort was enough of a presence in their lives that they made their way to the ribbon cutting ceremony. Jan Hensrud said she is excited about the bridge completion because now it will be easier to visit friends who live further down the river road. Also, she is happy the construction traffic of the pat year will be a thing of the past. “There has just been a lot of big trucks driving by our house,” she said. 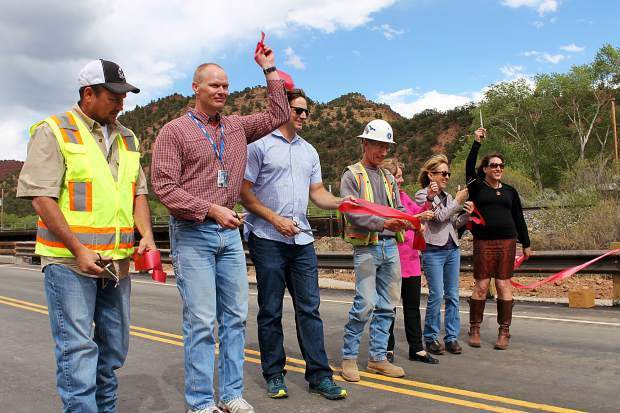 The $3.2 million Red Dirt Bridge project marks replacement of the last single-lane bridge along the Colorado River Road. The Federal Lands Access Programs provided grant funding for 80 percent of the construction costs. Construction of the Red Dirt Bridge began in July 2016. It replaced a 15-foot wide, single-lane, 5-span bridge, which was 200 feet in length and constructed in 1945. The new bridge is 31 feet wide with two 11-foot-wide lanes and two 3-foot shoulders. It has three spans and is 220 feet long. According to Rickie Davies, Eagle County senior staff engineer, the project did present its share of challenges. “It got fairly complicated,” Davies said. He noted the bridge pier shafts had to go deeper than originally anticipated. As the county worked to resolve the engineering challenges, there were also transportation challenges to consider. At various times, the information signs along Interstate 70 warned motorists that the Red Dirt Bridge work meant closure of the Colorado River Road. Hardest hit by the construction were, of course, the folks who will benefit most from the new bridge. Davies said it was a challenge to provide nearby residents access to their homes. “We had to build this on top of itself,” he said, noting that meant the road was impassible at times. “We have a lot of families who live along this road who have been very patient for the road to go through,” said Commissioner Jill Ryan during Monday’s ceremony. “Your reward is this fabulous new bridge,” said Commissioner Kathy Chandler-Henry. During their remarks, the county commissioners also thanked the Federal Highway Administration, project general contractor Dietzler Construction, various subcontractors and the county road and bridge and engineering employees who were involved in the bridge construction.